Writer's Digest Books, 9781599639154, 304pp. Great writing requires more than an original idea, compelling characters, or a scintillating plot. An author needs all of these to be successful, but writing--and writing well--also demands an entirely different skill set. Spellbinding Sentences arms you with the tools you need to master the power of the English language. In this book, you'll learn the different qualities of words and the many ways those words can be combined to create sentences that hook readers. You'll emulate sentences from your favorite writers, practice proven techniques, and develop your skills one step at a time. The result? 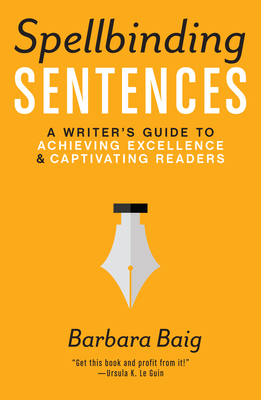 Your ability to craft excellent sentences will become second nature--and those sentences will hold your readers spellbound, page after page. Barbara Baig is a writer whose passion is teaching writing. She created the position of Writing Instructor at The Divinity School at Harvard University, where she taught for two decades. She now teaches in the MFA Program in Creative Writing at Lesley University, one of the top-rated low-residency programs in the country, and for the Maine Writers and Publishers Alliance. She offers free writing lessons at www.WhereWritersLearn.com and is the author of How to Be a Writer: Building Your Creative Skills Through Practice and Play, also from Writer's Digest Books.